The Urban Cow Pace Team is sponsored and supported by our good friend Mike Ong of Lyon Realty. Are you interested in running a specific time or perhaps a personal best in the half marathon? Plan ahead to have our pace team help you reach your goal. We will have pacers for the following Half Marathon finish times: 1:25; 1:30; 1:35; 1:40; 1:45; 1:50; 1:55; 2:00, 2:05, 2:10, 2:15; 2:30; 3:00; 3:15; and 4:00. We wish you the best of luck in achieving your finish time goal! Melvin was born in Kenya ,and immigrated to the US just three years ago. 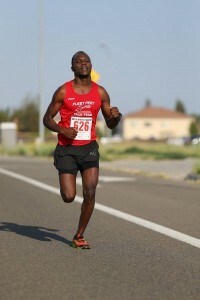 As a lifelong runner,Melvin has been on a quest to run in the Boston Marathon,and his dreams just came true when he qualified at the 2015 Modesto Marathon running his PR of 2:48:08. 2015 has been Melvin’s best year when he reached his PR goal for the Half Marathon when he ran his PR 1:14:17 at the Rina’s Half Marathon in Ripon,CA. Melvin continued his running success and he represented Yuba College at the 2014 NorCal XC Championships in Fresno. 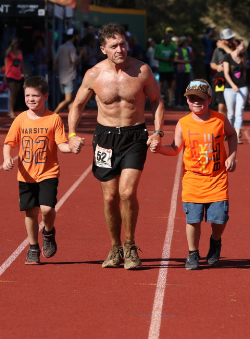 Apart from running road races,Melvin also run Obstacle Races such as Spartan Races,Atlas Races and Mud Races.He works Full-Time as a Machine Operator which sponsors him through his races. Melvin enjoys running as part of his hobby,a way to stay fit as well as travelling and making new friends.Find Melvin on Facebook. I began running later in life, in my 30's. I currently run for the Sacramento Running Association Elite group, focusing on USA Track and Field cross country and road racing. I have completed over 25 marathons including NYC, Chicago and Boston. Best marathon time was CIM at 2:44 and was the winner of the masters Napa Marathon, 6th overall. I enjoy trail running, completing multiple ultra marathons from 50km to 100km. As for pacing, my experiences include Urban Cow 1/2, CIM and Western States among other races. Looking forward to Urban Cow and helping everyone in my pace group. I’m an active member of Sacramento’s running community. Because it was my first half and because of what it means to Rich, I’m loyal to Cow Town and the Urban Cow it has become. My involvement in the city’s running events spans distances. I shared pacer duties for the 3:00 group at CIM in 2016, and I’ve paced many Shamrock’n Half marathon groups to 1:30 and 1:40 finishes. I have also had an annual date with a running skirt and a wig for 5k, 10k, and 13.1 mile groups at the Women’s Fitness Festival events. I’ve had my best marathons on the east coast, nabbing a 2:42 PR in Boston’s wind and rain in 2015. I’ve developed a dirt problem that seems to flare up every spring. It brought me a first overall at the (since ended) Run on the Sly 50k event. That toe in the ultra distances hasn’t deterred me from the occasional 5k, but I tend to favor 10 milers, half, and full marathons. I hope you find a way to use our pace this year to secure or strengthen your love affair with Urban Cow. I consider it the most special road running event the community has to offer. I started running eight years ago. My first running goal was to complete the Urban Cow Half Marathon. The course snaked through my neighborhood and seemed like a natural fit. After than race, I was hooked. I have run the Urban Cow 5k, twice finishing second. This included the race where I dipped under seventeen minutes for the first time. Currently, I love racing with the Sacramento Running Association's Elite Team. Nothing beats a good cross country race! My recent PRs include a 58:39 from SacTown Ten and a 23:33 at the Aggie XC Masters (10th Overall). My recent Half Marathons have all been under 1:20. I look forward to seeing everybody at the race! Mark has been an avid runner since 2000 where his immediate goal was to qualify for the Boston Marathon, which he accomplished on his first marathon attempt. While training with the Buffalo Chips Running Club, Mark was then coached to a sub-3:00-hour marathon, where he has since PR’d with a 2:45. It was in 2004 that Mark turned his attention to trails and the ultra-marathon distance and now boasts ten consecutive, sub-24-hour Western States 100-Mile finishes including one top-ten finish. Other favorite trail races include American River 50, Silver State 50, and Waldo 100K. Mark combines his passion for running with his enjoyment of helping others reach their running goals by pacing at Urban Cow. Mark has led an Urban Cow pace group for four years and has always come in right on the moo-ney. Rob has been running regularly for the last 6 years. He was motivated to begin running when his kids were running cross country and track in high school. Since that time, Rob has made running a part of his life. Rob lives in Fair Oaks, CA and routinely runs trails and paths around Sacramento with the Fleet Feet Racing team. He loves variety in the routes he finds and often seeks out new paths in and around the area. As an active member of the running community, Rob has led group runs and helps others explore what the Sacramento area has to offer for runners. He enjoys all types of day and night-time running activities from road to trail to obstacle to relay courses and just recently completed the 130 mile Ragnar Tahoe Trail relay at Soda Springs with his team achieving a 1st place age (Masters) group finish. Rob has run multiple 5ks, 10ks and half marathon races and has often had podium finishes in his age group. This will be his first pacing opportunity and he is excited to help motivate those to meet or exceed the 1:45 mark. My boys William & Spenser helping me through the final lap for Western States 2017 (11th finish). Per my race number, I was 52. Now I'm 53. Number of marathons completed: 40+–most all under 4 hours, in addition to 9 marathons as part of Ironman Triathlons. Marathon PR: 3:25:09 San Francisco Nike 2005. 4th in age. Marathon awards: Wow I would love one! Marathon finish of which you are most proud: All of them really, but mainly the ones I have not had to go to the medical tent afterwards! Number of ultra marathons completed: 60+ to include (7) 100’s: 5 Western States, Tahoe Rim and Leadville. Ultra marathon awards: 15+ awards for age groups to include a 7:53 PR at American River 50 and Five (7) 100 mile buckles. Event finish of which you are most proud and why: My 1st Western States 100 and my 1st Ironman. The journey it took me on to get to the start and ultimately the finish was priceless. How many Boston Marathons? 3. Coaching experience: Nothing formalized however being a Pace Leader I receive a lot of questions and I am happy to help at no cost so others can enjoy the thrill of getting fit and the thrill of finishing what they set out to do. Other pacing experiences: California Intl Marathon 4hr pace group Leader: 2008, 2009, 2010, 2011, 2012, 2013, 2014m Modesto Marathon 4hr Pace Leader 2013, Urban Cow Half Marathon 2008, 2009, 2010, 2011, 2012, 2013,2014 Clif Bar Pace Team 2012. When you have four kids, all girls in my case, you are either running after them or running out to catch a breath of fresh air. We are very fortunate to live in an area with great places to run, a fantastic running community, and an array of exciting running events. I’ve BQ’d with 3:23’s at the Chicago Marathon and Mountains 2 Beach Marathon. We are going to have a blast running 13.1 miles while working together to achieve your goal! Started running as a youngster and never really stopped. I just finished my 10th marathon a few weeks ago which was a PR at 3:34:02. I have run three Boston Marathons and will run Boston again in 2016. Half-marathon is my favorite distance. This will be my first pacing experience and cannot wait to share the excitement of half-marathoning will others! Ken Press, a life long resident of Sacramento, has made running a part of his life since he can remember. His first half marathon was the Sacramento Half Marathon (now the Urban Cow) and has made this race an annual tradition. After coaching a number of people for half and full marathon, Ken decided to expand his coaching into a profession training program – Sacramento Friends in Training or Sacfit as it is known by most. In the eight years since founding Sacfit, Ken and his staff of 80 coaches have provided a fun and inspiration training program for over 5000 runners and walkers and have helped them achieve goals ranging from finishing their first marathon to qualifying for the Boston Marathon. Along the way, Ken founded what has become one of the largest Sacramento Springtime events – the American River Parkway Half Marathon, the sister race to the Urban Cow Half Marathon. Recently, Ken expanded Sacfit to include Sacfit Ultra, an ultra-marathon training program and has successfully coached every participant to completing 50K, 50 mile, or 100 mile races. In his “spare” time, Ken has completed numerous races of varying distances and is a veteran of five American River 50 mile races and a finisher of the 2012 Western States 100 mile Endurance Run. I’ve been running for over 10 years; CIM was my first marathon! I have been a CIM pace group leader for the past 6 years. The majority of my training is focused on ultras. I have completed many ultra-distance races; most recently Angeles Crest 100. I am excited to be a pace group leader at Urban Cow for the first time, and look forward to helping you achieve your goal! I caught the running bug 7 years ago after a number of years of basketball and racquetball. Over the years, I did many races from 5k to 50 Miles. This is my 6 consecutive Urban Cow and recently joined Fleet Feet Sacramento Harey Tortuga as mentor. There is no better feeling than helping other runners reach their goals while having lots of fun along the way and the thrill of the competition. I can’t wait to hit every mile split time and see runners achieve their goal with a smile. After a brief hiatus from Urban Cow last year I am very happy and excited to be back leading the 2:30 pace group. Most of my running is typically done on trails, but it’s always nice to be back at Urban Cow, which was my first half-marathon. My running experience includes a variety of trail races, including Western States, and the Tahoe Rim Trail 100 mile races. Anne completes her races as a power walker. Her first race was in 2011, Clarksburg Half Marathon. She got the bug and since then has completed 10 half-marathons including Shamrock’n, the Parkway Half and others. She has branched out and completed a few trail races, her favorites being She Rocks and Run on the Sly. Anne has completed 5 marathons CIM a couple times, Avenue of the Giants and River City Marathon, where she placed third in her age group. Races provide challenges; help to keep her healthy and working toward positive goals. Anne has three grown daughters, enjoys hiking and just being out in nature. Her goal is to one day complete a trail marathon. I started running in 1998. My first marathon was in 1999 and it was Avenue of the Giants!!! I was able to run a couple of others (including half of Comrades in South Africa (which was over a marathon) as well as a couple of 50Ks including Way Too Cool. However, after an unfortunate ankle incident, I am no longer running. BUT, I’m walking now!! Since I starting walking, I now walk marathons and ultras!! My first walking marathon was Cowtown in 2009!! I have walked 7 marathons (including the Disney World Goofy Challenge), a 50K, several half marathons, and a 50 miler for my 50th birthday!! In addition to walking marathons, I have also power walked several 50K events and two (2) 50 milers!! I have fun while I’m walking and you will too!! !